The Chautauqua Institution is a not-for-profit, 750-acre educational center beside Chautauqua Lake in southwestern New York State, where approximately 7,500 persons are in residence on any day during a nine-week season, and a total of over 142,000 attend scheduled public events. Over 8,000 students enroll annually in the Chautauqua Summer Schools which offer courses in art, music, dance, theater, writing skills and a wide variety of special interests. The Institution, originally the Chautauqua Lake Sunday School Assembly, was founded in 1874 as an educational experiment in out-of-school, vacation learning. It was successful and broadened almost immediately beyond courses for Sunday school teachers to include academic subjects, music, art and physical education. While founders Lewis Miller and John Heyl Vincent were Methodists, other Protestant denominations participated from the first year onward, and today Chautauqua continues to be ecumenical in spirit and practice. Chautauqua's Department of Religion presents distinguished religious leaders of many faiths from this country and abroad, both as preachers and teachers. The Chautauqua Literary and Scientific Circle (CLSC) was started in 1878 to provide those who could not afford the time or money to attend college the opportunity of acquiring the skills and essential knowledge of a College education. The four-year, correspondence course was one of the first attempts at distance learning. Besides broadening access to education, the CLSC program was intended to show people how best to use their leisure time and avoid the growing availability of idle pastimes, such as drinking, gambling, dancing and theater-going, that posed a threat both to good morals and to good health. To share the cost of purchasing the publications and to take encouragement from others in the course, students were encouraged to form local CLSC reading circles. Soon these were established throughout the country and, in time, around the world. Among those who benefited most from the CLSC program were women, teachers, and those living in remote rural areas. At the end of their four years of study, students were invited to come to Chautauqua to receive their certificates in a ceremony, which is still held today during the first week in August. By 1880 the Chautauqua platform had established itself as a national forum for open discussion of public issues, international relations, literature and science. Approximately 100 lecturers appear at Chautauqua during a season. Music became increasingly important at Chautauqua, especially after the turn of the century. A symphony orchestra season became part of the regular program in 1920. The Chautauqua Symphony Orchestra, founded in 1929, now performs thrice weekly with leading soloists in the 5,000-seat Amphitheater, Chautauqua's program center. Popular entertainers perform other evenings. The Chautauqua Ballet Company also appears in the Amphitheater, sometimes with guest artists, while the Chautauqua Conservatory Theater presents its season in Bratton Theater. The Chautauqua Opera Company, also founded in 1929, performs in English in Norton Hall. Chautauqua plays a unique educational role today, offering studies on a vacation level, a more serious level and a professional level. In addition, there are enhanced learning opportunities within Chautauqua's other programming. Music, the arts, religion, recreation and the pursuit of knowledge are all available. Younger and older students often share learning experiences in an open, congenial atmosphere. Children and young people are also provided with their own special programs. The Chautauqua Institution is governed by a 24-member board of trustees, four of whom are elected by property owners. The board establishes the policies and direction of the Institution, electing the officers who are responsible for the operation of the Institution. Smith Memorial Library and the Chautauqua Institution Archives are open year round. 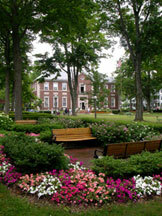 Between-season conferences are held at Bellinger Hall, the Athenaeum Hotel and other facilities on the grounds.